There has been a terror attack at London Bridge in the centre of London in which eight people have died and at least 48 people injured. 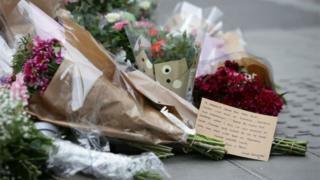 A white van hit pedestrians on London Bridge at about 10pm on Saturday, then three men got out and attacked people in nearby Borough Market. Police arrived within a few minutes and the three men believed to be responsible for the attack were killed by the specially trained police. Dozens of emergency service workers were sent to the scene and the injured were taken to five London hospitals to be treated. Police investigations into what happened are continuing. A group called Islamic State has said it was behind the attack, but police haven't confirmed if that is true. Guide: What is Islamic State? The bridge has reopened and so has the nearby tube and rail station. But other areas where the attack happened are still closed off. Flags across the capital and the rest of the world have been lowered to half-mast. A minute's silence was held on Tuesday at 11am in the UK, to remember those who have lost their lives and everyone else affected by the attacks. There was also a silence at the One Love Manchester concert on Sunday night, for the victims of both the Manchester and London attacks. 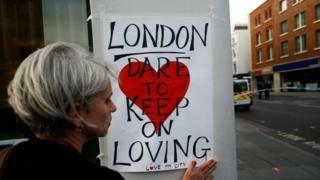 Messages of support have been sent from other cities around the world. In Paris, France, the lights of the Eiffel Tower were turned off. In Berlin, Germany, a union jack flag was displayed. London Mayor, Sadiq Khan, said it was "a deliberate and cowardly attack on innocent Londoners", but the capital remained the "safest global city" and Londoners would not be cowed by terrorism. 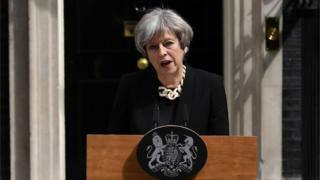 British Prime Minister, Theresa May, has said that more action to deal with terrorism needed to be taken "here at home". She added: "But the whole of our country needs to come together to take on this extremism, and we need to live our lives not in a series of separated, segregated communities, but as one truly United Kingdom." After the attack, most of the UK political parties briefly stopped campaigning for votes ahead of the general election on Thursday. The prime minister confirmed that Thursday's election would go ahead as planned.